The Bhallas and Iyers prepare for Roshni and Adi’s baby’s naming ceremony. The celebrations get in swing. Ishita gets happy that Mihika is guiding Roshni in baby care. She shares the happiness with Raman. Simmi gets angry when she sees the family members celebrating. She tells Parmeet that they should better run away before they get caught. Parmeet doesn’t want to leave Bhallas. He finds his profits by staying in the family. He consoles Simmi. He tells Simmi that they have to stay back and take revenge. He reminds her Ananya’s death. She tells him that she won’t give up, she will exact her revenge. He gets happy to fool her. He is using Simmi against her own family. Ishita feels emotional seeing Mihika raising the baby with love. She tells Raman that Romi couldn’t father a child, but with Adi’s child, Mihika got a chance to show her affection towards a baby. He tells her that everyone deserves such happiness. Iyers guide Bhallas through the rituals. 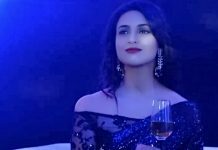 Raman praises Ishita’s stunning looks. They both share the work happily. Raman and Ishita look after all the arrangements. The family members get ready for the naming ceremony. Parmeet convinces Simmi to keep enemies close and attack when they get a chance. He asks Simmi to act good to family so that they can have a good image. Ishita wonders why didn’t anyone come till now. She asks Raman to ask the neighbors to come on time and grace the event. The neighbors boycott the event by calling the baby illegitimate. They tell Raman that they can’t be part of the naming ceremony of an illegitimate child. They oppose Bhallas, who are passing a wrong message to the younger generation. They tell Raman that everyone will have children out of wedlock if they think its easy to get acceptance by the society. Parmeet instigates the neighbors more. The neighbors remind the limits of the society. He asks Raman not to break the norms. Raman tells them that they are ruining the society this way. Ishita scolds them for talking worse about the baby, who isn’t at fault. She defends the baby and Roshni. Raman asks the neighbors to leave. Raman and Ishita assure Roshni that they will always be with the baby. Roshni witnesses the drama and makes a mind to leave the house.